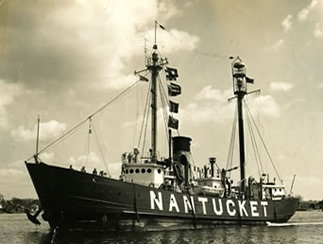 Two other Nantucket lightships are in existence and privately owned: LV-613 and LV-612. LV-112: Original structure, prior to receiving major damage, caused by Hurricane Edna, while on station on 9/14/54 (when the bridge was rebuilt, fewer port holes were installed - compare photo of LV-112 bridge as a Relief vessel). (USCG photo - courtesy of Bernie Webber) 1954: Sep 14, during Hurricane Edna in 70 ft seas and 110 mph winds, bow plates damaged, bridge and pilot house stove in, small boats demolished and rudder severely damaged; minor injuries to several crew members.